This set features 20 quality KidsPlay bells ranging from A to E, allowing you to play a good variety of songs including all of the songs in our 8 note and 13 note books, as well as many more songs of your choosing. The bell section is made of metal for a nice clear tone. 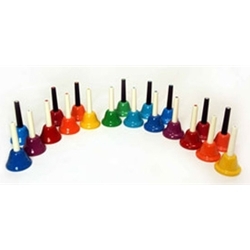 This set features the same bright colors and accurate intonation of all KidsPlay handbells.